You can add the Status Indicator field to any task sheet. This field displays icons that indicate whether a task is completed, on schedule, or behind schedule. Select the column heading next to which you want to insert the Status Indicator column. Click Insert, Column. In the Field Name list, click Status Indicator. If you prefer to show current task status as text rather than icons, insert the Status column instead. 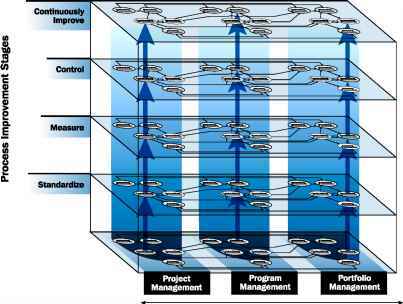 For every task, the status of "Future Task," "On Schedule," "Late," or "Complete" appears (see Figure 11-6). Figure 11-6. Add the Status Indicator or the Status fields to a task sheet to see task status at a glance. You can add progress lines to your Gantt Chart that provide a graphic means of seeing whether tasks are ahead of schedule, behind schedule, or exactly on time. Progress lines are shown for tasks that have been completed, are in progress, or are currently due. They are not shown for tasks in the future. 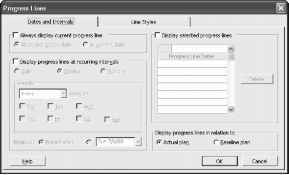 For any given progress date, which you can set as the status date, you can have Microsoft Project draw a progress line connecting in-progress tasks and tasks that should have started (see Figure 11-7). You can set the progress date to be the current date, the project status date, or any other date you select. You can also set multiple progress dates at recurring intervals; for example, on the first Monday of every month. The progress line date is January 14, 2004. This task is on schedule. This task is behind schedule. Figure 11-7. The left-pointing peaks indicate a negative schedule variance, whereas straight lines show tasks that are exactly on schedule. • A progress line angled to the left indicates work that's behind schedule as of the progress line date. • A straight progress line indicates a task on schedule as of the progress line date. 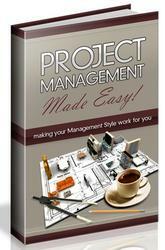 • Tasks untouched by the progress line are tasks starting in the future from the progress line date. 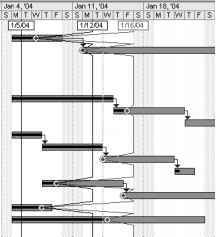 1 Display the Gantt Chart, Tracking Gantt, or any other Gantt view. 2 Click Tools, Tracking, Progress Lines. The Progress Lines dialog box appears (see Figure 11-8). Figure 11-8. 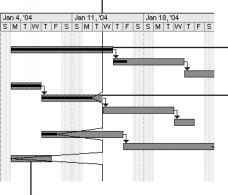 Set progress lines in the Gantt Chart using the Progress Lines dialog box. On the Dates And Intervals tab, select the Always Display Current Progress Line check box. Then select whether you want the progress line to be displayed at the project status date or the current date. The project status date, as well as the current date, is set in the Project Information dialog box (Project, Project Information). If no status date is set there, the current date (today) is used instead. Under Display Progress Lines In Relation To, select whether you want progress lines to reflect the actual plan or your baseline. Set any other preferences for the way you want dates and intervals of dates to be represented with your progress lines. You can enter specific progress line dates, display progress lines at selected date intervals, and so on (see Figure 11-9). Figure 11-9. Specify as many progress lines as you need for your purposes. 6 Click the Line Styles tab, and set your preferences for the way you want the progress lines to appear in the Gantt Chart. You can specify the line type and color and the progress point shape and color for the current progress line and other progress lines (see Figure 11-10 on the following page). Figure 11-10. Use the Line Styles tab in the Progress Lines dialog box to customize the way progress lines appear in your Gantt Chart. In the chart area of the Gantt Chart, click where you want the progress line to be added. The Progress Line pop-up shows the exact date you're pointing at. ® I 1 Click Tools, Tracking, Progress Lines. £ 2 Make sure the Dates And Intervals tab is showing. H 3 Clear the Display Selected Progress Lines check box. The defined progress lines are removed from your Gantt Chart, but the dates remain in the Progress Lines dialog box for when you want to show them again. 1 Click Tools, Tracking, Progress Lines. Make sure the Dates And Intervals tab is showing. 2 Under Progress Line Dates, select the progress line you want to remove from the Gantt Chart and then click the Delete button. 1 Click Tools, Tracking, Progress Lines. The Progress Lines dialog box appears. 2 On the Dates And Intervals tab, clear the Always Display Current Progress Line check box.